ECG23 is D&#39;Addario&#39;s lightest gauge of flatwound strings. Chromes&#39; smooth feel and warm, mellow tone is ideal for traditional jazz, rockabilly twang, R&amp;B and some pop/rock styles. D&#39;Addario Chromes are wound with flattened stainless steel ribbon wire which is polished to an incredibly smooth surface. Chromes deliver a distinctive damped but tone-rich sound that only flatwounds can produce. 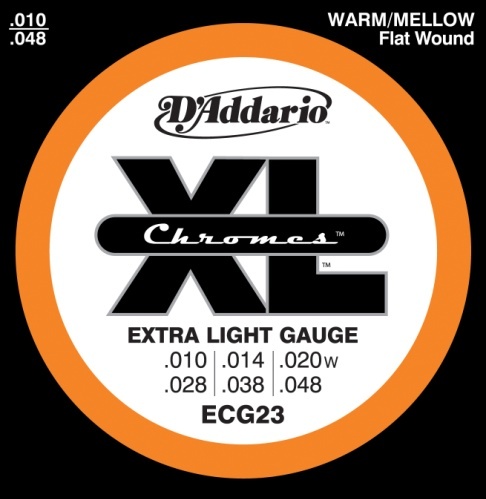 D&#39;Addario Chromes are the world&#39;s most popular flatwound strings.